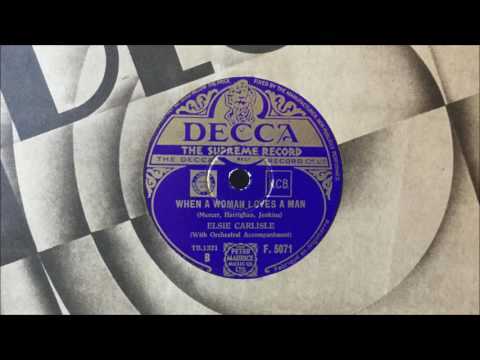 “When a Woman Loves a Man.” Words by Johnny Mercer, music by Bernard Hanighen and Gordon Jenkins (1934). Recorded by Elsie Carlisle with orchestral accompaniment on June 14, 1934. Decca F. 5071 mx. TB1321-2. It must first be noted that the song “When a Woman Loves a Man” recorded by Elsie Carlisle for Decca is not the Billy Rose/Ralph Rainger composition that Fanny Brice introduced in the 1930 film Be Yourself, but rather a later composition by prolific American songwriters Johnny Mercer, Bernard Hanighen, and Gordon Jenkins. Both songs describe women in love as being wholly different from their male counterparts and in most ways more admirable in terms of tenacity and loyalty, but the Mercer lyrics have a sentimental quality that poses a special problem for the singer. How can one make such bold generalizations about half of the human population without seeming disingenuous? Fortunately, one of Elsie’s many talents was to add sincerity to her material by way of measured pathos, and in this recording the beauty of her delivery allows us to suspend disbelief. Elsie had made a recording of “When a Woman Loves a Man” on June 1 with Ambrose and His Orchestra, but it was rejected. Other notable versions of the song were made in America by Eddy Duchin and His Orchestra (with vocals by the DeMarco Sisters) and by Art Tatum; British versions were recorded by Pat Hyde (accompanied by Edgar Jackson and His Orchestra), Harry Roy and His Orchestra (with vocals by Harry Roy himself), and Phyllis Robins.